Portland's reign as America's largest bastion of fluoride-free water is facing a revolt. 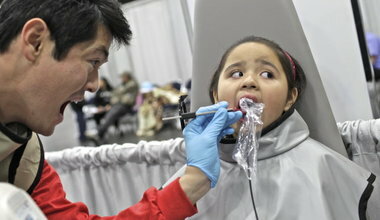 Amanda Rodriguez, 4, keeps her eyes fixed on her mother as she sees a dentist during Portland’s 2011 Mission of Mercy, the Oregon Dental Association’s outreach to those without dental care. Oregon has one of the nation’s lowest fluoridation rates, and one of the nation’s highest rates of child tooth decay. Portland’s status as a fluoride backwater may soon change, but only if a pro-teeth majority demands it. City Commissioner Randy Leonard says he wants to fluoridate Portland’s water supply, as The Oregonian’s Brad Schmidt reported Thursday. Leonard, who oversees the Water Bureau, needs two other commissioners to join him. He could get a unanimous vote if the council decides to get serious about Oregon’s unexpectedly high decay rates. But city commissioners are also political creatures, vulnerable to the pleadings and threats that pour into their inboxes, worried about the fallout from angering a loud constituency. Like Oregon lawmakers who’ve dared to champion fluoride in past years, they might get beaten down and drop the whole thing. They might — but not if they hear from enough parents, business owners and others with a personal stake in healthier teeth. Quick science: Fluoride is a form of the element fluorine, and it occurs naturally in water.Maintaining a water supply with a fluoride level of about 0.7 milligram per liter — either by adding fluoride or diluting its concentration — fights decay by protecting teeth against sugars and acids. Fluoride varnishes and toothpastes work too, but they’re more effective when combined with fluoridated water. In fact, the Centers for Disease Control and Prevention calls fluoridation one of the great public-health triumphs of the 20th century, along with seat belts, vaccines and contraception. Yet Portland remains the largest city in the United States that fails to fluoridate its water supply. It’s strange. The city adds chlorine and ammonia to disinfect its near-pristine Bull Run water. It adds sodium hydroxide to reduce the corrosion of water pipes. Citizens pay the price. Portland pushes Oregon to 48th in the nation for fluoridation rates. Not coincidentally, Oregon children have among the nation’s highest rates of tooth decay — and about 16 percent of Oregonians above the age of 65 have lost all of their natural teeth. Meanwhile, the nation’s dental problems appear to be worsening, fueled by poverty, poor access to dental care and the prevalence of teeth-killers like juice and energy drinks. Dr. Phil Wu, a Kaiser Permanente pediatrician who works in community health, says he’s dismayed by the dental decay among Oregon children. The problem translates into more children visiting the ER for tooth pain, needing expensive dental work and, ultimately, turning into adults with bad teeth. A massive coalition of health organizations, medical associations and community groups is behind the push to fluoridate Portland’s water. They’ve moved gingerly, trying to build support below the radar. They know from watching failed fluoridation efforts in the Oregon Legislature and elsewhere that any public debate will be swiftly dominated by those who describe fluoride as an industrial toxin that kills salmon, causes cancer and probably triggers autism, too. A council vote may take place as early as September. The pro-fluoride folks have a chance of winning this time. But to prevail, the dentists and public-health advocates can’t do it alone. Regular voters need to step up, too, by testifying at hearings and emailing their opinions to the mayor and commissioners. They need to be public about wanting water fluoridation, the dental-health equivalent of wearing a seat belt in a speeding car. It’s the only way to ensure a fair fight with the anti-fluoride lobby, which rarely smiles and usually wins.